Market Street’s Shrimp & Grits! | Delicious! Delicious! Market Street’s Shrimp & Grits! The only car out tonight is a stretch limo racing down the still warm pavement. Odd sight considering the area. Caryn and Mr. R. are positioned at their opposite ends of the car, a mound of luggage piled on the seats between them. Mr. R. peers out the window. Caryn looks out her window, but the car is enveloped in utter darkness. Shall we fetch some roadkill? Mr. R. leans forward and rolls down the dividing window to speak to the driver. Can you pull off at the next town to grab a quick bite? The driver acknowledges the order but Caryn isn’t as willing to accept the change in plans. We’ll be late for our flight. Don’t worry. They’ll accommodate me. I’m in first class. Caryn sinks back into her seat and mutters to herself. The limo turns down a street bringing them into the center of an old, southern town. Beautifully preserved buildings lock in the secrets of their long history. Mr. R. is considering his options when he sees the restaurant. Stop here. This looks good. Caryn and Mr. R. find themselves in the door of a classy, dimly-lit restaurant of polished wood. Dessert plates on the tables have been wiped clean, but the many happy DINERS show no signs of leaving just yet. The HOST, a very tall man with dark hair, walks up and greets them. Friendly but showing no signs of recognition of his famed guest. Can we see a menu? He hands them a menu and the two pour over it with discerning eyes. The lengthy list of delectable selections is a virtual buffet of southern classics, spiced up nicely by some signature recipes. Mr. R. turns on the charm to the host. Would it be possible to get some food packaged to go? I thought you were concerned about missing the flight. Caryn turns to the host. As they are shown to a table, Caryn mutters to herself. Reduce stock by 1/4. Then, add cream, basil, wine and seasoning. Heat to simmer then add roux. Whisk until it coats back of spoon. Add grits to boiling water**, whisking. Add cream, peppers and seasoning until thick. Add cheese, stir until melted. 10 per plate – sauteed shrimp. 21/25 count works best. Peeled and deveined. Works best in large pasta bowl. Sauce on top and around. Place shrimp around and on top of grits. Garnish with green onions and chopped bacon. Chef Opal’s recipe is an estimate based on her cooking in quantity for the restautant. Adjust portions as necessary, especially with the grits. YUMMMM. I will confess, I have never had grits. I’m from the west coast, and sadly, grits are not something you see here everyday. I may have to try it though, it sounds wonderful. I wonder if those two will make their plane? Nice photo. You are definitely skilled with a camera! I’m kinda new reading this blog…do we know who Mr R is? Can I find out? Three and half cups of cream? Yowzah! No wonder it looks so yummy…! How many does that recipe serve? I’m a grits lover in Japan. I had it quite often when I stayed in Mississippi for apx. 3 1/2 years. 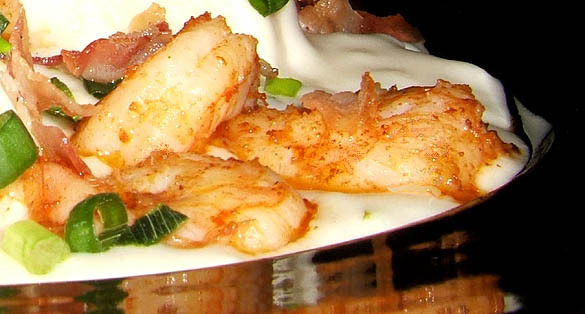 Now your photo of shrimp and grits is really making me drool! This site is a very special place for me… I love your food photos and stories related to the place I miss a lot. Thanks for keeping it up. I’ll be frequenting. Amy, yes, this recipe makes A LOT of grits….my guess is that it serves twelve. So cut it in half. And maybe cut it in half again. Thanks, Yvette. I’ve been so out of touch lately with my travels, but I will definitely peruse your site as soon as I have a few moments free. Konnichiwa, Obachan! Wow, Japan and Mississippi are two totally different environments! I have been somewhat remiss on my June posts, but promise to improve. Thanks for frequenting. Caryn, this looks so yummy… I’m sorry I keep asking stupid questions, but what are Grits like…? Are they like polenta?